Livingston’s Christmas parade this year included a group of American Indians. They had a very interesting entry in the parade, and when they walked past where I was standing, I couldn’t resist asking one in hearing distance of me where they were from. The answer I got ... "From here!" was very much a surprise to me. And that was all I needed to begin asking around as to the possibility of talking with some of them. My inquiries got me an invitation to visit in the home of Kevin and Michelle Benefield overlooking Mitchell Creek on Dale Hollow lake near the Overton/Clay County line. I was invited on a Saturday, the day the Benefields observe as their Sabbath which begins at dusk on Friday night, and ends at dusk on Saturday night. Kevin and Michelle believe their ancestry goes back to the Cherokee Indians, and observe and practice traditions and beliefs their ancestors did. Kevin’s Indian name is Eagle Eye, Michelle’s is Pipsissewa, their daughter, Kelly, is White Feather, and their son, Kevin, Jr., is Soaring Eagle. A Bible study class was in progress when I arrived. Others present for the observance of the Sabbath were Ben Louallen, whose Indian name is Little Bear, David and Emily Varela and their five children, friends of Kevin and Michelle, and Larry Poston, or Two Wolves, the Indian name he is known by. The Bible study was conducted with the use of "The Scriptures"which affirms the Hebraic roots of their beliefs. Two Wolves, whose hair is shoulder length, wore a head band, several turquoise rings and bracelets, but most convincing about his Indian heritage was his playing of the flute. When I asked him who taught him to play, his reply was that it was a gift he had been given by the Creator. It was eerie listening to him play which he did quite well. The atmosphere he created with his music made it easy to think we were all seated outside a teepee around a campfire. When asked to do so, Two Wolves conducts seminars about American Indians, and has many interesting theories of his own about how much of history and beliefs the white race has is not correct. He stresses that we have all been given the responsibility to care for the earth and all the creatures on it, and it is obvious he is greatly concerned by the lack of interest most people show in the state of the natural world around us. Kevin is also quite knowledgeable about the religious beliefs his family practices, and spent quite a bit of time explaining to me just why they believe the way they do. "The Scriptures" are relied upon as the basis of their beliefs. The Benefields have several pets they consider part of their family, two of which they told me are part Siberian Husky-part Wolf. They are both very beautiful animals, and definitely fit in with the Indian atmosphere evident in the surroundings of their owners’ home. 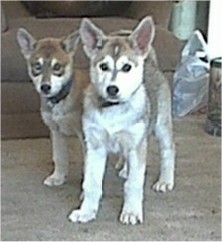 Their names of Wayah and White Fang. In a ceremony held near Chattanooga, Kevin and Michelle recently reaffirmed their marriage vows to each other. 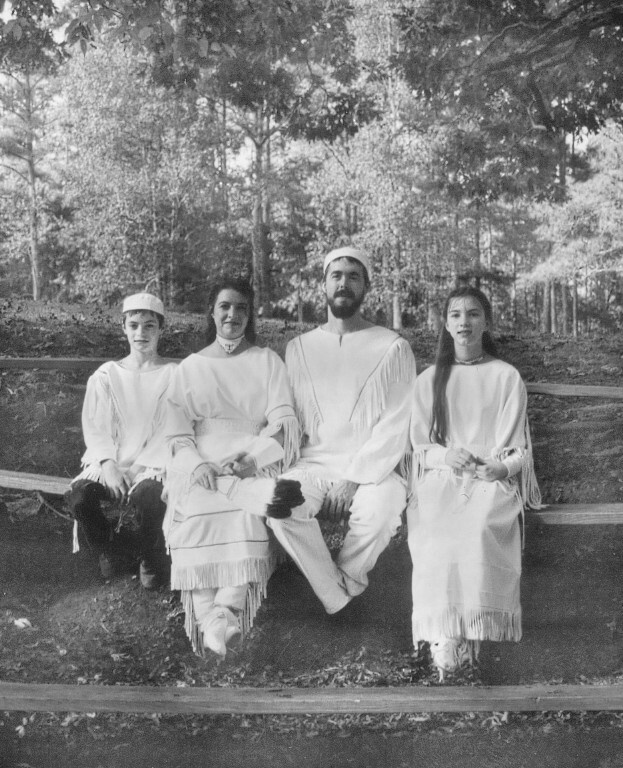 The festive event, conducted entirely in a Cherokee/Hebraic style and custom, was attended by a large number of people, including their two children, Kelly and Kevin, Jr. All of the Benefields, as well as others who attended, were dressed in traditional Cherokee/Hebraic clothing for this special event. The time I spent with these folks that Saturday afternoon was quite an enjoyable learning experience for me, and one in which I observed those who definitely walk to the beat of a different drummer. Thank you, Kevin and Michelle, for the hospitality shown to me in your home, and for allowing me to share your story.